Seventh-century jihad against "apostates and hypocrites"
The new "caliphate" of Abu Bakr al-Baghdadi—the Islamic State, formerly "ISIS"—recently made clear that it means to follow in the footsteps of the original caliphate of Abu Bakr al-Sadiq (632-634), specifically by directing its jihad against fellow Muslims, in Islamic parlance, the "hypocrites" and "apostates," or in Western terminology, "moderates." This came out in the context of the current conflict between Israel and Hamas, with some Muslims asking the newly formed "caliphate" when it would launch a jihad on the Jewish state. The Islamic State's response? "Allah in the noble Koran does not command us to fight Israel or the Jews until we fight the apostates and hypocrites." Twenty-first century jihad against "apostates and hypocrites"
There's much to be said about this response, rife as it is with historical allusions. First, it is true. After the prophet of Islam died, a great number of Arabian tribes that had submitted to his rule by becoming Muslims—the word muslim simply means "one who submits"—thought they could now renege, and so they apostatized in droves. This sparked the first Ridda, or "apostasy wars," waged by Abu Bakr al-Sadiq, who became the first caliph on Muhammad's death in 632. For nearly two years, till his own death in 634, his caliphate's entire energy was focused on waging jihad on all the recalcitrant Arab tribes, forcing them by the edge of the sword to return to the fold of Islam. 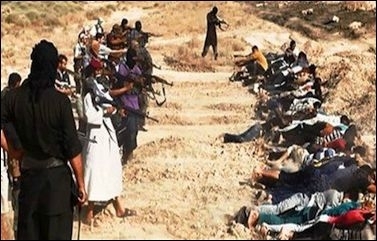 Tens of thousands of Arabs were burned, beheaded, dismembered, or crucified in the process, according to Islamic history, especially by the "Sword of Allah." It was only afterwards, under the reign of the second caliph, Omar al-Khattab (634-644), that the great Islamic conquests against the "original infidels"—those non-Arab peoples who had never converted to Islam, Christians, Jews, Zoroastrians, etc.—took place. Islam's war on the apostate, so little known in the West, figures prominently in Islamic history. Indeed, Sheikh Yusuf al-Qaradawi, one of the most influential Islamic clerics today, while once discussing the importance of killing any Muslim who apostatizes from Islam on Al Jazeera, correctly stated that "If the [death] penalty for apostasy was ignored, there would not be an Islam today; Islam would have ended on the death of the prophet." In short, and as the Islamic State is now arguing, the first and greatest enemy of Islam—the "nearest" enemy—is the "apostate" and "hypocrite," for they are the most capable of subverting Islam from within. The answer is found in Salah ad-Din al-Ayubi [Saladin] and Nur ad-Din Zanki when they fought the Shia in Egypt and Syria before [addressing] Jerusalem. Salah ad-Din fought more than 50 battles before he reached Jerusalem. And it was said to Salah ad-Din al-Ayubi: "You fight the Shia and the Fatimids in Egypt and allow the Latin Crusaders to occupy Jerusalem?" And he responded: "I will not fight the Crusaders while my back is exposed to the Shia." All of this history quoted by the Islamic State is meant to exonerate the new caliphate's main assertion: "Jerusalem will not be liberated until we are done with all these tyrants, families, and pawns of colonialism that control the fate of the Islamic world." Although the Islamic State is trying to suggest that only autocrats like Syria's Bashar al-Assad are "apostates" and "hypocrites," and that most average Muslims are eager for Sharia, the fact is, a great many of the world's Muslims fit under this rubric. The largest revolution in history, Egypt's June 2013 anti-Brotherhood revolution, attests to this. Thus the new caliphate's jihad is not just against "tyrants," but many average Muslims as well, as the organization's carnage in Iraq and Syria attests. The Islamic State's declaration justifying non-confrontation with Israel is not winning it much popular support in the Arab world and is naturally portrayed as a copout. It further validates the popular Arab narrative that the United States is siding with the Islamists to create havoc in the region; to have the various sects (Sunni vs Shia, Moderate vs. Islamist) fight each other in order to divide and weaken the region. Thus Dr. Ahmed Karima, a leading professor of Islamic jurisprudence in Al Azhar, said that the Islamic State's position concerning Israel proves that "it is a creation of U.S. and Israeli intelligence" and that the new caliphate "is the biggest of all hypocrites." Alternatively, others, especially Islamists, appreciate that the Islamic State is patterning itself after the first caliphate of Abu Bakr—hence why its first caliph chose that name—because it finds itself operating in the same circumstances. 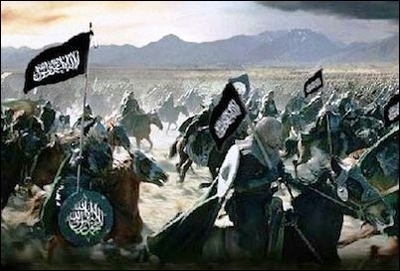 Nascent and without much support, it first mission, like Abu Bakr, is to re-subjugate Muslims to Islam. Only then can it focus on the "original infidels." While this approach may be temporarily good for Israel (and all infidel states), in the long run, a fully functioning and unified caliphate with "reformed" Muslims next door is not a pretty picture. After all, the Islamic State is not exonerating the infidel, but rather saying his turn will come once the caliphate is capable of an all-out assault. At best, it's a temporary reprieve.